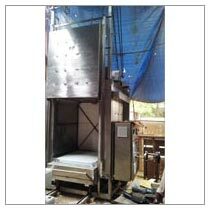 We are a premier Manufacturer, Supplier and Exporter of Bogie Hearth Furnace from Mumbai, Maharashtra. Used for continuous heating of large parts, over Bogie Hearth Furnace can easily fire up to 1200 deg C. Our robust fabrication technique of the furnace makes it possible to provide uniform heating throughout the metallic or non-metallic parts. Clients from all over the world can order our Bogie Hearth Furnace at reasonable rates. Provision for high temperatures with non-metallic heating elements like silicon carbide, super kanthal etc. Applications include stress relieving, tempering, annealing & normalizing.